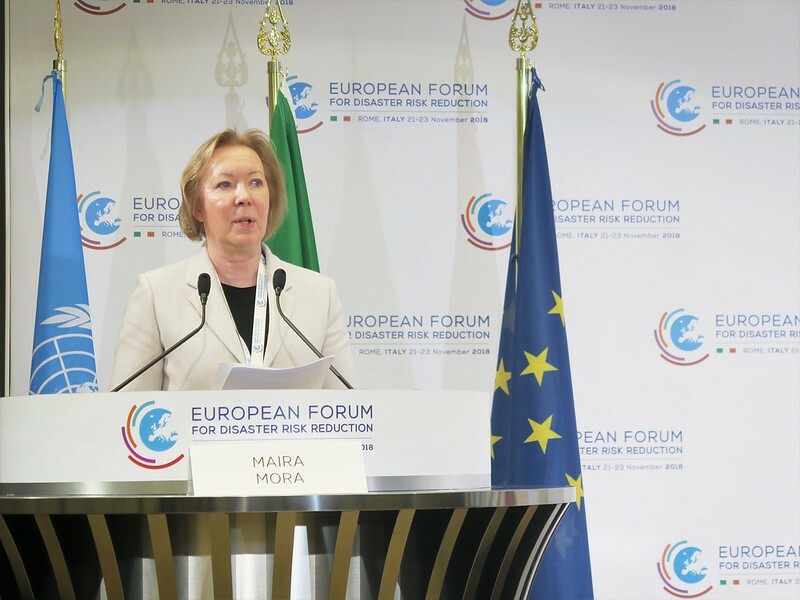 The 2018 European Forum for Disaster Risk Reduction (EFDRR) was held 21-23 November 2018 in Rome, Italy. The EFDRR, as Regional Platform for Disaster Risk Reduction, is recognised by the UN General Assembly as the main forum at the regional level for strategic advice, coordination, partnership development and the review of progress in the implementation of international agreements on disaster risk reduction. Recognising a growing role of the CBSS Secretariat as a catalyst and a facilitator of the UN Sendai Framework implementation in the Baltic Sea Region, UNISDR invited the CBSS delegation to represent the region at the Forum. The delegation was led by the CBSS Secretariat Director General, Ambassador Maira Mora and included the Secretariat’s Civil Security team and a representative from the Baltic 2030 Unit. The Forum with 600 participants was opened by the Italian Prime Minister Giuseppe Conte. The State Fire and Rescue Service of Latvia, the current presidency of the CBSS Civil Protection Network, organised a session during the European Forum for Disaster Risk Reduction 2018 in Rome on 21 November 2018. The session was opened by the UN Special Representative of the Secretary-General for Disaster Risk Reduction, Mami Mizutori, who praised Latvian initiative and the CBSS efforts in implementing the UN Sendai Framework for Disaster Risk Reduction: “I welcome exemplary work of the Council in embracing Sendai as a framework for transboundary risk reduction… disasters have no boundaries!” The session, attended by experts and Sendai Focal Points from the Baltic Sea Region concentrated on harmonization of data collection for the monitoring of the Sendai Framework implementation and in particular on the definition of a disaster, which often varies from country to country. The participants agreed on the need to continue such discussions in the CBSS format focusing on regional monitoring, capacity building and sharing of best practices. CBSS Secretariat’s Director General Ambassador Maira Mora was invited to represent the Baltic Sea Region at the High-Level Roundtable on “Protecting Europe’s citizens: the social contract on disaster resilience” which was held on 22 November 2018 during the European Forum for Disaster Risk Reduction in Rome. The roundtable, co-chaired by the Government of Italy and the UNISDR, saw the participation of European Ministers and Deputy Ministers, the European Commission and the World Bank. The Roundtable also highlighted that the European region has experienced devastating heatwaves and floods and deadly forest fires which have exposed the vulnerability of citizens and natural systems. The high-level delegates discussed a variety of issues such as how and where to enhance cooperation on disaster resilience, how to best anticipate and manage increasing disaster risks and the consequent disruptive social and economic impacts, how to shift from response to better disaster risk management, and ultimately how to better protect citizens from all kinds of disasters. Ambassador Mora also opened a plenary session “Implementing Sendai Framework, SDGs and Paris Agreement in a Coherent Way” on 22 November 2018 in Rome. In her keynote speech, Amb. Mora highlighted the importance of international cooperation in Disaster Risk Reduction and bridging the cooperation gap between climate change experts and civil protection professionals – to enable real prevention and preparedness for current and emerging security risks related to climate change. She illustrated how this gap could be bridged in the Baltic Sea Region with an example of the upcoming CASCADE project, which will increase the urban resilience in the BSR by equipping city planners with tools to assess risks related to the climate change. “The most relevant issues in the Baltic Sea Region related to the implementation of the Sendai Framework are to take stock of the risks, to organize capacities for receiving international assistance in disaster situations, to exchange information between the countries and to have common principles when it comes to monitoring of the implementation”, added Ambassador Mora, while giving an overview of the Secretariat’s Civil Security team activities in facilitating international cooperation on societal security. Such prominent presence of the CBSS in the EFDRR 2018 was a recognition of the efforts of the CBSS Secretariat’s Civil Security team in facilitating BSR cooperation in disaster risk reduction, which intensified with the inclusion of Sendai Framework as one of the priorities in the Joint Position on Enhancing Cooperation in Civil Protection Area, adopted by the Directors General for the Civil Protection in the BSR in 2017. The outcomes will be taken forward at the Global Platform for Disaster Risk Reduction, 13-17 May 2019 in Geneva, Switzerland.